Leading tipper manufacturer Lusty EMS will be showcasing their upgraded sliding lead tri-axle tipper at the 2013 Brisbane Truck Show. Speaking ahead of the show, new National Sales Manager Grant Kemp says that the Lead Slider is built with productivity in mind. In addition to being used as part of a B-double combination, the tipper is also designed to be part of an AB-triple combination with a market-leading payload, achieved through low tare weight design and years of experience. Some of the new features on Lusty EMS’ Lead Slider include a new rear pin assembly installed into the design, which simplifies servicing as well as a lightweight body beam that further increases payload without compromising on strength. 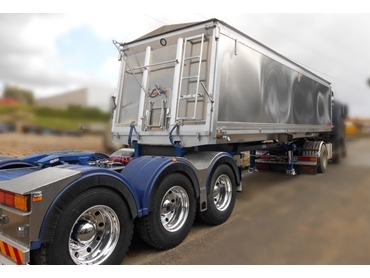 Mr Kemp explains that the low tare weight design of the trailer helps to increase profitability for the operator since a lower tare weight trailer naturally has a greater load carrying capacity, giving the owner the option of carting more, which in turn means greater profit per load. The display trailer sports a number of other features, including mill bright side sheets. Lusty EMS can be found on stand number 41 at the Brisbane Truck Show, which runs from 16th to 19th May 2013, at the Brisbane Convention and Exhibition Centre. Lusty EMS is part of the MaxiTRANS Group, which also supplies Freighter trailers.